It’s the first day of school for most kids, and the official beginning of fall. Some of us can’t wait for those brisk mornings, the color of the leaves changing, and getting to curl up on the weekends with a good book (or the SJC blog) and some hot coffee. Another tradition of fall is certainly apple picking, and locally-owned Schweizer Orchards is a true gem among apple orchards and as a family businesses in our region. 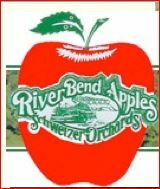 In fact, Schweizer Orchards has been a family-owned and operated business since the early 1900’s. Due to weather conditions and other land troubles, the orchard has moved around from Amazonia to Savannah and has now settled in the southeast part of St. Joseph. The current orchard is run by the third generation of Schweizers – Steve and Becky, along with sons and daughter-in-law, Nick, Cory and Allison. It’s a U-Pick orchard that grows blackberries, raspberries, blueberries, peaches, pumpkins and apples. What helps the orchard stay successful? Keeping it simple, offering the produce and the experience customers want to come back for season after season. They know they can expect beautiful arrangements of what’s available for that time of year, plus friendly service. They know they can bring the whole family for a consistently high-quality experience that feels like visiting a friend’s family farm. One notable aspect of the brand experience at Schweizer’s is a variety of jams and jellies, honey, nuts and candies, salsas and relishes, and so much more offered indoors. This allows shoppers to linger inside (or outside on their porch) while they browse for unique groceries and gifts and visit with the staff. They also sell their garden produce and the fruits that are in season. Since it still feels like summer, they offer apple or cherry cider slushes to cool you off, but when it gets chilly, there are a number of flavored ciders to choose from as well. You won’t regret heading up and spending a day with the Schweizer family. Right now, they’re offering ripe peaches to be picked, along with home-grown sweet corn, fresh tomatoes, zucchini, cucumbers, cantaloupe, and many other local produce offerings. Because Schweizer Orchards connects the farm experience to customers in a very real way, utilizing u-pick produce, fall hayrides, a great children’s play area and special family events, visitors feel like this place is a little bit theirs, too. In addition to their various adventures with fruits and veggies, they also provide a Choose and Cut Christmas Tree farm. Keep this in mind while counting down the days to Christmas! They provide fields for you to choose, either pre-cut, or you can take the whole family and cut your own. They’ll shake, wrap, drill, and load your tree while you sit back with some hot apple cider or hot chocolate to warm up. It’s never too early to start thinking about Christmas, right? Susan J. Campbell wants to recognize Schweizer Orchards for their hard work and dedication to producing fruits, veggies, and even Christmas for the northwest Missouri area. Perhaps even more importantly are the family memories and traditions they offer year after year in a hands-on, friendly atmosphere. Thanks, Schweizer Orchards!